New York (TADIAS) — Renowned Ethiopian American Chef, Restaurateur and Author Marcus Samuelsson is one of the honorees for this year’s FACE List Awards. The annual awards ceremony, which celebrates African role models from the around the world, will be held on Saturday July 9th in New York City. 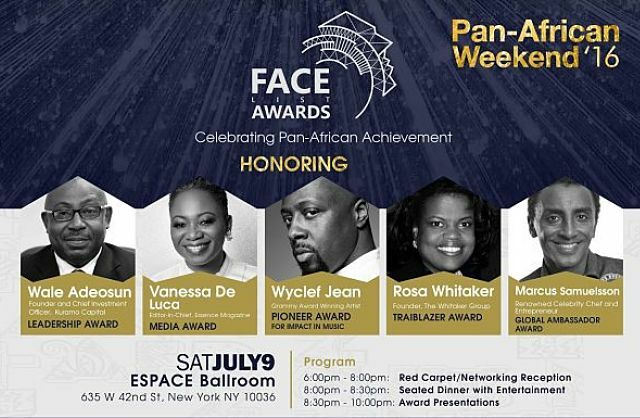 “Face2face Africa is excited to announce our incredible honorees for this year’s FACE List Awards, the most prestigious celebration of Pan-African achievement,” the organization said in a press release. In addition to Samuelsson, who will be recognized with the Global Ambassador Award, other recipients of the 5th Annual FACE List Awards include Editor-In-Chief of Essence Magazine Vanessa De Luca (Media Award) as well as Grammy award-winning Artist and Humanitarian Wyclef Jean (Pioneer Award for Impact in Music), and Rosa Whitaker, Founder, CEO and President of The Whitaker Group, who will be receiving the Trailblazer Award. Besides Marcus Samuelsson the only other Ethiopian-born individual to make the Face2face Africa list is Bethlehem Tilahun Alemu, who received the Entrepreneur Award in 2014 for her pioneering work as Founder and CEO of the international footwear brand SoleRebels. Pre-reception/Red-Carpet will commence at 6:30 p.m. Promptly followed by dinner and the awards show. Guests will enjoy a delectable full-course dinner. The Pan-African Weekend is Presented by Prudential Financial Inc.
Tickets, Group Registration, and Advertising are available. For more info: E-mail info@f2fafrica.com.